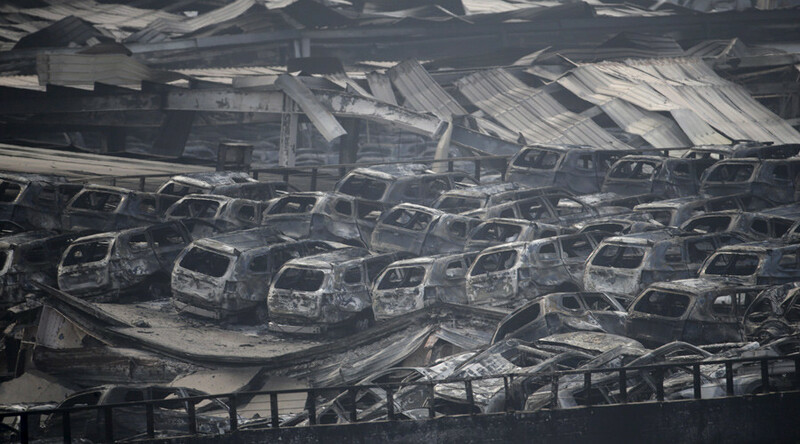 Heavily damaged houses, huge plumes of smoke and completely burned-out cars featured in almost post-Apocalyptic scenes in the Chinese port of Tianjin captured by a drone cam. The city was rocked by two huge explosions, killing dozens and injuring up to 500 people. Incredible new footage filmed by a drone shows the vast amount of damage caused by a series of explosions late Wednesday vening in the Chinese port city of Tianjin.More than 40 people were killed, including a dozen firefighters, and hundreds injured by the blasts.The latest updates on Grasswire.com. At least forty-four people have been killed and over 500 injured, according to state media reports. The explosions were caused by a shipment of explosives in a key industrial zone in Binhai New Area. The blast wave shattered windows in nearby offices and apartment blocks, and the impact was felt up to 10 kilometers away. Tianjin, one of China's biggest cities with a population of about 11.5 million people, is a major industrial and transport hub.